I recently won a battle with my perfectionism – or perhaps limped to the finish line is a more accurate illustration! I became aware of how my perfectionist nature was holding me back during grad school, so I knew that as I finished my PhD and transitioned into entrepreneurship I would have to keep it in check. The upside to being a perfectionist is that whatever you do manage to push out the door is very high quality, but the downside for me at least is that it takes me forever to decide a piece of work is ready. To this point, the monetized aspect of my business (teaching early-career PhDs about personal finance) has been delivering live in-person seminars and webinars at universities (17 and counting!). The great joy I experienced in creating and delivering my comprehensive presentation on this subject for the first time convinced me to start this line of self-employed work. However, these deliverables are ephemeral – they are one-time performances, at least as far as the audience is concerned. Over the last few months I’ve been evaluating how my business has developed to this point and how I want to evolve it going forward. One of the aspects that I wanted to change was to release some of my own products. After all, not every university is willing to book me for a talk and not every trainee at the universities who do would be able to attend, so I want to have great resources available to those trainees in addition to the content available at Grad Student Finances – something more functional than a collection of articles. Not only would these products be something self-contained and complete that I could point interested trainees to, but it would become a passive income stream for me – tons of work up front but no ongoing work (except perhaps advertising). I started with what I knew best: my comprehensive presentation for stipend-receiving graduate students that has received excellent reviews from the students who saw it live and my hosts. I decided to record a voice-over-PowerPoint extended version of this presentation. I completed the bulk of the recording last November, but continued to refine and edit the slides and my script over the next few months. I finally had to impose a deadline so that I wouldn’t continue tweaking endlessly, and I released the recording on Vimeo a few weeks ago. I am so happy that I can point to that recording now when students ask me how they can access the presentation content when they can’t attend live. The Graduate Student’s Guide to Personal Finance from Emily Roberts on Vimeo. Creating this recording was, strangely, a very different beast from delivering it live, and I have to say I like both modes quite a lot. Recording and editing my voice allowed me to make my phrasing quite efficient and exactly what I wanted to communicate, while the versions I deliver live are tailored according to the audience in attendance; the most enjoyable part of speaking live for me is answering questions from the audience. I think making this recording strengthened my live presenting and vice versa. I had received feedback on the live version this presentation from seven audiences before I started recording and another five while I was editing it, and the presentation evolved quite a bit based on their input. Recording the video also helped me find exactly what I wanted to say on each slide and cut down on repetition and superfluous information. In March, I also released three short guides in Kindle form. I essentially finished writing them last September, but they languished all fall and winter as I think I was nervous to take the next step to actually release them. When I finally asked a few friends to edit them for me, they were so encouraging about the quality of the content that I was motivated to push the guides out the door. I’m especially proud of these guides because of how detailed and highly practical they are. While my comprehensive presentation by its nature has to take a 30,000-foot view of personal finance, these guides really drill down into narrower subject areas to take readers step-by-step through relevant exercises. 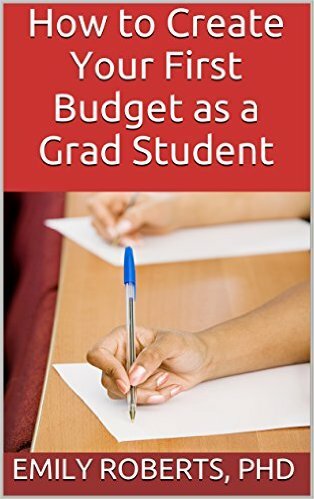 Each guide helps graduate students resolve the question “How should I organize and use my money?” in unique and highly practical forms. One guide is focused on budgeting, one is focused on values and goals, and one is focused on handling irregular expenses – all favorite topics of mine on this blog that I worked through extensively during grad school to great benefit to my own finances. Now that these guides are completed and “out there,” I’m actually planning how I can adapt them into one or more live workshops that I could run for early-career PhDs – another way creating these products is enhancing my live work! As much as I enjoy speaking live and interacting with audiences, I have found great satisfaction in creating these products. While my presentations and Grad Student Finances will always be works-in-progress, my comprehensive presentation video and these guides are complete and self-contained. Having completed them, I am now free to move on to other creative projects while still being able to point to them as deliverables. Have you completed anything lately that you are proud of? Do you prefer to watch videos or see a live performance? 2 Responses to "The Pleasure of Finishing Something"
I agree on the convenience factor of video, but I think people take in-person presentations more seriously.